Traditions of dance in the early Renaissance, like the traffic of trade, were interwoven across Europe, each distinct area influenced by others at different times. For specific detail, we are reliant upon written records and therefore on accounts left by the educated classes. 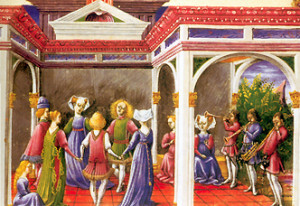 Performances mounted for court entertainment in fifteenth-century Italy regularly included dancing and eye witness accounts from the French, English, Scottish and Spanish courts show that dancing was common there too. Luckily, even with the passage of so much time, we can boast of the heritage of a rich and varied repertoire. In the sources we have, men and women dance much the same steps and start a step with the left foot, something that feels rather odd to dancers today. Dance played and important part in the court life of Burgundy, a large area north of the Alps including some of today’s France, Germany and the Netherlands. Our best source for the nature of Burgundian dance comes from a manuscript in the Brussels Bibliotheque Royale, Les Basses danses de Marguerite d’Austriche c1490. Printed in gold and silver on black paper, it describes more than 50 bassedanses. The basse dance is thus the best-documented dance style of the fifteenth century (Italian bassadanze; Spanish baixa). It is a measured and stately dance for the nobility and gentry, intended to display their undoubted magnificence. For the most part, they danced as couples, one or more at a time, but in northern Italy more ambitious configurations were devised for varied numbers of dancers – who parted, came together, circled and executed other movements to make patterns. Music in the fifteenth century was freely exchanged and adapted, with the same tunes being used for secular songs, dances and even for masses. 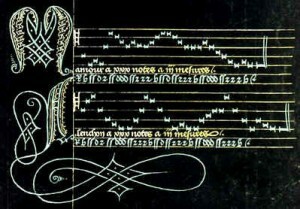 Several song melodies were re-used as basse dance tunes and at least one basse dance tune was used as the basis for a mass. There are remarkably few CDs of basse dances played as they might have been played in the 15th century. While plenty of recordings are based on the most popular basse danse tenor (La Spagna) these do not give a realistic idea of how the tenors were used as accompaniment to the basse dance itself. However, Les Haulz et les Bas has recorded some excellent CDs (in particular Gothic Winds which features several Burgundian/French basse danses played by the alta capella wind band). There are a great number of French basse dances for which we know the sequences, although rather fewer for which we also have music. The earliest choreography that we have for a basse dance is 1445 and the latest 1589 (in the memoirs of the elderly cleric Jehan Tabourot, alias Thoinot Arbeau, who reminisces in his Orchesogrpahy about dancing it when he was young). The basse dance very probably pre-dates the first written source and was certainly still in use in the 1550’s (if the dance music collections are any guide), and over the century or more in which it was danced it evolved. By the late fifteenth century the French style had evolved a set of rules governing the composition of basse dances, that cannot be applied to the older dances and somewhere between about 1510 and 1538 the basse dance was simplified and standardised to make it more like the pavan (which eventually replaced it). The basse dance itself was usually paired with one or sometimes two companion dances (in France the basse dance mineure with pas de Brabant, in Italy the saltarello and in Spain the alta and ioyos). However we have rather less information about these companion dances than we do about the basse dance itself. In Italy a new style of dance was invented in the second quarter of the fifteenth century that combined bassadanza with elements of popular dance. Modern dancers refer to this style as the Italian ballo. These dances could be for up to 10 dancers. The invention of this Lombardian style is generally attributed to Domenico of Piacenza, a dancing master at the court of Ferrara, who was the first to describe them in a manuscript written circa 1455. More of these dances are described by another dancing master Guglielmo Ebreo (who later changed his name to Giovanni Ambrosio on converting to Christianity) and by the courtier Antonio Cornazano. The surviving copies of the manuscripts by these three authors provide choreographies for 56 balli (including music for 27 of these), together with 45 bassadanza. This style spread throughout the various courts of Italy, with numerous variations developing, for example, in Spanish-dominated Naples and in Burgundian-influenced Ferrara. These highly codified dances became a cultural marker for membership in the various ruling classes. The different treatises vary, but Domenico can be taken as a guiding figure. His work is a sophisticated discussion of the theory as well as the practice of dance in his time. He speaks of four different tempi — the bassadanza‘s slow elegant 6/4, the 4/4 of quadernaria, the moderate 6/8 or sometimes 3/4 of saltarello and the quick 2/4 or faster 6/8 of piva. The interrelationships of these tempi are subtle and complex. In addition, Domenico describes the six basics of all dance essential to any aspiring dancer; his opinions still resonate today. The dancer must respect misura, or measure, so that steps respond to the music; memoria or memory must be absolutely sound to allow for flexibility and expression; compartimento di terrano is the skill of judging steps and patterns to varying spaces and to other dancers; maniera or style describes the various graceful movements of the dancing body as a whole, with some details about specific movements; aire seems related maniera since it describes an overall nimble lightness, an airy rising quality; finally diversita di cosa suggests the value Domenico places on the individual response to dancing, a subtle diversity and variation in the execution of dance, what we might term expression. The step vocabulary is discussed in a number of sources, so that we have a broad idea of their nature. Continenzi were small steps to change weight, a doppio was what we might call a double, though a variety of types were used. Turns or volte were full or half, or ornamented, a volta goiosa. Movimenti were quick movements of the body for punctuation, while passi were steps. Riprese were sideways steps, while riverenze, saltarelli and salti were varied. More showy steps included scambiamenti and scorsi. All of these steps differed according to the tempi in which they were being performed. A variety of dances existed – for couples, groups of couples, lines and trios for example. In Italian court entertainment, one of the most important, and perhaps most difficult to codify, seems to have been the moresca, which, like later masque dances, was usually composed specifically for an occasion such as a wedding, a feast or celebration. Such dances might be based on classical, allegorical or symbolic themes which displayed the wealth, power and superior personal qualities of the patron. However, as with the later masque dances, surviving descriptions are not adequate to define the defining character of moresce. A couple of dances described in Ambrosio’s manuscripts were called balli francese. What did they dance in England? Examples of the English tradition in fifteenth century dance can be found in the Gresley manuscript (dated to 1500 plus or minus 20 years), part of the Gresley of Drakelow papers. The text is a small notebook written by John Banys, now held in the Derbyshire Record Office in Matlock. It contains 92 dance titles , but only 26 choreographies, some music and no step descriptions. The dances are somewhat similar to those in the Lombardian style, but we have far less detail about how they were danced. Italy was very much a style setter at the time, so perhaps it is natural to find Italian influence in these dances. All across Europe, it is more than likely that there were traditional vernacular dances, like the circle dance shown in the picture below, or the caroles described in some medieval sources, dances which everybody knew so well that nobody bothered to write them down. The picture from Borso’s Bible is not alone in showing that such dances were enjoyed by the well-to-do. See Learning the Dances for details of instruction-books and recorded music produced by the Dolmetsch Historical Dance Society (now HDS Historical Dance Society), Gaita and by Nonsuch Productions and others. These give interpretations of how to dance many of these dances, along with their music. Home of the Rendance mailing list. Also includes background information about Renaissance dance. Extensive pages of the Society for Creative Anachronism (SCA). Includes background information, primary sources, analysis and links. An HTML transcription of Arbeau’s _Orchesoraphie_ (1589). If you want to create your own reconstructions of these dances then, conveniently, almost all of the surviving evidence for fifteenth century dance has been pulled together into the first two books below. Other studies follow. W. Smith, Fifteenth-Century Dance and Music: twelve transcribed Italian treatises and collections in the tradition of Domenico da Piacenza (Dance & Music Series, no 4, 1995). This contains (not always adequate) English translations. D. Wilson, The Basse Dance Handbook (Wendy Hilton Dance and Music Series 16; Pendragon, 2012). F. Crane, Materials for the Study of the Fifteenth Century Basse Danse (Musicological Studies, vol 16, 1968). D. Fallows’ collection of English dances of c.1485, Royal Musical Association Research Chronicle, 29 (1996), 1-20. M. Inglehearn & P. Forsyth, The Book on The Art of Dancing: Antonio Cornazano (London, 1981) [translation]. R. Mullally, The Brussels Basse Dance Book (Dance Books, 2015). B. Sparti, Guglielmo Ebreo of Pesaro: On the Practice or Art of Dancing (Oxford, 1993; 2nd ed. 1995) [edition incl. translation and introduction]. D. R. Wilson, 101 Italian Dances (c. 1450 – c. 1510) (Early Dance Circle, 1999). D. R. Wilson, The Basse Dance Handbook (Wendy Hilton Dance and Music Series 16; Pendragon, 2012). D. Cruickshank, Danzare et Ballare 1 & 2 (2 booklets, Salisbury, 1988, 1989). D. Cruickshank, Danzare et Sonare (booklet, Salisbury, 1992). J. Dillon, The Language of Space in Court Performance, 1400 – 1625 (Cambridge, 2010). S. Howard, The Politics of Courtly Dancing in Early Modern England (Amhurst, 1998). A & P Kent, Cherwell Thy Wyne: Dances of fifteenth-century England from the Gresley Manuscript (DHDS, 2013). J. Nevile, The Eloquent Body: Dance and Humanist Culture in Fifteenth-Century Italy (Indiana University, 2004). E, Tribble, “Dancing Music and Song” in Early Modern Actors & Shakespeare’s Theatre (London, 2017). D. R. Wilson, Domenico of Piacenza (Paris, Bibliothèque Nationale, MS ital. 972) (Early Dance Circle, 1988). [transcript]. D. R. Wilson, The Steps used in Court Dancing in Fifteenth-Century Italy (3rd ed., Cambridge, 2003). I. Guest, The Dancer’s Heritage, a Short History of Ballet (London, 1960). Unlike many historians of dance, Ivor Guest uses his first 3 chapters to survey developments in dance from the 15th century to Romantic ballet.